I used the chart of the different types to create a spreadsheet of sites and type numbers of ceramics for the EBA III types. I used Shawn Graham’s instructions for using Gephi to convert a multimodal network to a unimodal network. I think this visualizations is a perfect example of this picture does not show you what you think it does. 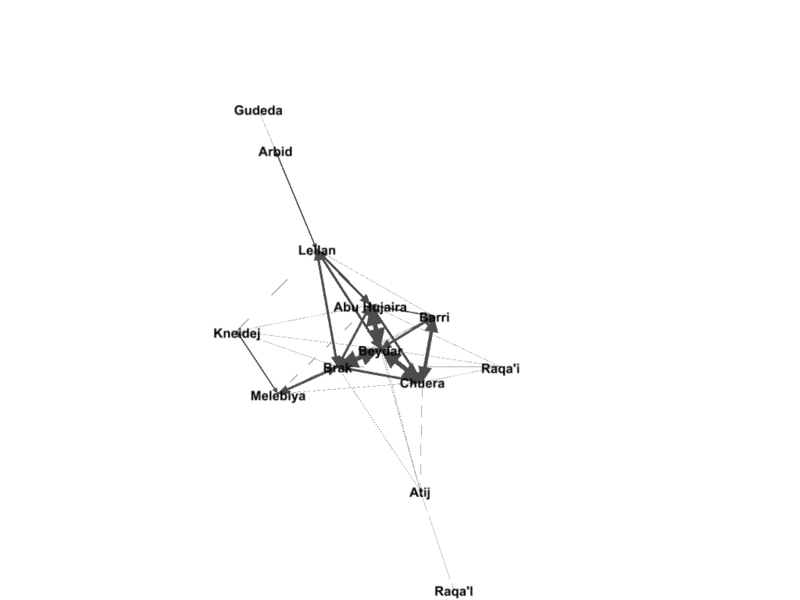 By that I mean, Beydar comes out highly centralized and has the most types in common with the other sites (i.e. highest node degree), but this is due to how the data was chosen. Basically, what this visualization shows is that the author used the most examples from Beydar, and not-coincidentally I think, it’s because she worked at Beydar. Obviously I only created this as a test and to see how the transformation would work, not because I thought that a list from a table of one article would provide me any meaningful correlations between sites. In that sense I found this exercise to be helpful, as it gave me a chance to think about what data I will really need to do this kind of analysis, how it might be standardized (sharp-eyed readers might see that Raqa’i accidentally appears twice due to misspelling – should probably unique identifier numbers for sites to avoid this kind of problem), and what I might want to measure. Overall though I found the process of creating my own csv file, then converting it in Gephi to be a useful way to spend a morning as far as my own education goes. So your TL:DR for today is – be careful how you construct your data, because maybe your visualization will just show you the site where the author worked.